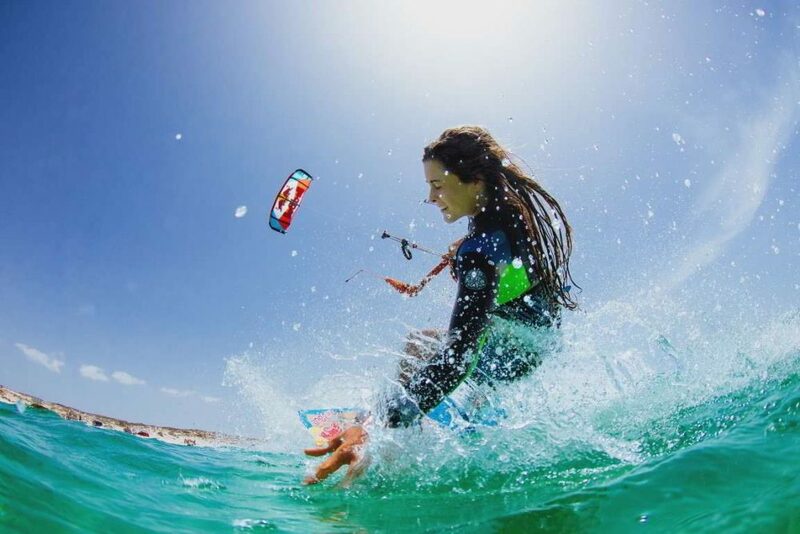 Gisela Pulido Borrell is a Spanish kitesurfer. She is a sporting prodigy of our times. Gisela Pulido’s biography is the story of what is probably the youngest world champion in the sport’s history. Gisela was born in Barcelona in January 1994. Her first years of life are spent in the Maresme, a region of great tradition in the practice of the nautical sports, where the child from an early age shows great interest in everything related to the sea. Another of her passions is sports, especially those that involved a degree of risk, hobby she shares with her father. She being endowed with great competitive spirit gets her first sporting success in swimming. Gisela got into kiteboarding in the summer of 2001 and in July 2002 when she received her baptism as kitesurfer. The young athlete evolved beautifully in the practice of this sport and in the absence of competition in Spain, where she showed her skills, participated in the European Junior Championships 2003 with being just 9 years old she won 1st position (U-14) and 2nd place in (U-18). With these perspectives, lapping the dilemma of supporting family kiteboarding professionally or maintain activity arising at the amateur level. With the arrival of the first sponsor (Rip Curl) Gisela included support to convince her father to let her participate in professional competitions. The deal is that if she can continue to compete on the podium, but wait to be older. The father accepts and is convinced that young Gisela shall not achieve its objective and that this will allow her to gain time in which certainly points as the greatest vocation of the girl. The surprise came in April 2004 when Gisela is ranked 3rd in the KPWT Sables D’Olonne stage (France). A month after Junior European Champion U-21 was proclaimed in June 2004 and she won her first stage win of the world in Istanbul. Gisela culminates an incredible year in New Caledonia, which was proclaimed World Champion in the professional circuit KPWT in November 2004 at the age of 10 years. Given such a scenario, the Pulido family moved their residence to Tarifa for the young Gisela can reconcile professional kiteboarding with her studies. Gisela’s life undergoes a radical change, travels around the world and she increase her training hours. This forces the Red Bull coaches Diagnostic & Training Center to limit her browsing time, to control as kitesurfing affect physical development in early age. 2005 was to Gisela another successful year in her career, dominating the Kitesurf World Cup (KPWT) and attracting the interest of the press and sponsors. Achieved spectacular victories in Brazil and Australia at the prestigious Gravity Games and proclaimed World Champion again. Without doubt, 2006 is the most important year in the career of Gisela. Her physical development is correct and that the training allows more intense and progresses technically. Get major sponsorships with Telefónica Movistar and Adecco. A leader in the World Cup for the first time KPWT, she will face the World Champion in the PKRA, Kristin Boese circuit. For Gisela this is a dream come true and that is certainly the most important victory that gets to Boese in Fuerteventura in August 2006. In September she proclaimed Spanish championship with adding a new title to her resume. Gisela ends a great season with 4 wins on the World Tour and won in Noumea, New Caledonia KPWT three-time World championship. 2007 is the year to Gisela enshrined as a great athlete. The awards began in March when she is nominated for Laureus World Sports Awards in the category extreme sports, and setting a new record by becoming the youngest athlete ever nominated for this award. Laureus World Sports Awards (considered the Oscars of sport) open the door to the select club of the 5 best extreme athletes in the world. In November 2007 Gisela receives the Guinness World Records as the youngest World champion. In December she is honored at the 70th Anniversary Gala Brand, as one of the top 100 athletes of Spain, being the youngest athlete to achieve this distinction. In the sports world, 2007 is a big year for Gisela. In March receives authorization from the Kiteboarding Professional Riders Association (PKRA) to participate in all events of the World Cup. After retaining her title of Champion of Spain, in September 2007, proclaimed first PKRA World Champion in Germany. Gisela dominates the professional circuit with 6 wins and second places 2nd in the 8th stage in which she participated. 2008 was a difficult year in the career of Gisela. The World Cup becomes a much more demanding competition. The World Tour event goes from 6th in 2004 to 10th in 2008 to Gisela stages, the challenge is to combine school attendance with travel competitions and events sponsor. On the other hand, the level of technical rivals continues to increase and this forces Gisela to train longer and harder. 2008 is a year full of accolades for Gisela, receiving two major awards: Best Catalan and Andalusian Sportsman. The World Tour in 2008 was the most difficult to Gisela has faced. With victories over 6th 10th total events, obtained in October, its fifth World Crown in the cold waters of Matanzas (Chile). 2009 was a challenging year for Gisela. The main objective is to defend his world title, but also create her new kite school, Gisela Pulido Pro Center. It is also a transition year for the sport. The ISAF (International Sailing Federation) recognizes kiteboarding as a new kind of candle. This will be the last year with two different World Circuits (PKRA and KPWT) and two different official titles. The aim of Gisela is to be crowned World Champion in both tours, but a knee injury limited her assistance PKRA ompetitions, so it focuses her to battle to win the KPWT. In December 2009, World Champion Gisela KPWT Essaouira is crowned. The year ends with the celebration of the title, a small party in Madrid, and the presence of Jaime Lissavetzsky, Spanish Secretary of State for Sports. 2010 was a historic year for kitesurfing. For the first time there will be an individual world title for the discipline, and the official recognition of the ISAF. Gisela re-enters the sport’s history, after becoming World Champion in freestyle and wave division. The year begins with Gisela hard training in Dakhla. The goal is to improve your level and get in good physical shape to the first phase of the World Tour held in Thailand. Gisela surprised the judges with the implementation of a new maneuver, the “kiteloop slim chance” and achieved victory in Asian lands. The fight for the world title in 2010 was the most difficult in the history of kitesurfing. Gisela faces its biggest rivals, Bruna Kajiya and Karolina Winkowska that decries be the strongest competitor throughout the season. To overcome these two obstacles, Gisela offers its best kitesurf. After 10th hard events present in the 5th continents, 2010 World Champion is crowned at Gold Coast, Australia. A media level 2010 is also an important Gisela year. International media echoes their athletic feats as crossing the Strait of Gibraltar competing against Ferry crossing from Tarifa to Tangier. Gisela character is present in fashion magazines, Cosmopolitan and gives the “Fun Fearless Female” award for Best Sportsman. Gisela was confirmed in 2011 as the best kiters in the history of the sport, with her 8th consecutive world titles in freestyle mode. The athlete is having a great time away from her roof. Gisela walks to her coming of age with a very promising future. Her results in competition, the athlete surprise even own World Champion after winning in the absence of 2nd World tests remaining. At sporting level, Gisela has become more technical and consistent rider and begins to offer its first power strokes in the execution of her maneuvers. This year Gisela receives medal of the Royal Order of Sporting Merit awarded by the Sports Council. Her popularity continues to increase appearing in all lists of the Best Spanish Athletes of 2011 And to end the year, is recognized by the supplement of ABC, Woman Today, as one of the most admired women of the year. In 2012 despite winning major competitions Kitesurf World Tour held in France and Germany); World leader and being virtually the entire season, the third athlete proclaims the end of the year. Gisela participating for the first time in one of the most prestigious competitions in the sport, the Triple-S, achieving victory in the disciplines of freestyle and waves. Her career is progressing, publishing a book about her story, Sin Miedo A Caer, written by Natalia Arroyo. It is also home to one of the most important fashion magazines, Woman Today.